Based in Silicon Valley, Velodyne Lidar is the technology that allows autonomous vehicles (AV) to ‘see’ with pinpoint accuracy. 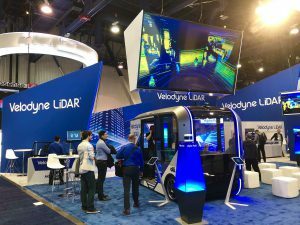 Velodyne Lidar challenged LCI to communicate the company’s leadership in the burgeoning market while also reassuring the consumer public that autonomous vehicles will reduce roadway fatalities. LCI partnered with Bianchi Public Relations (PRGN Detroit, USA) to make a concerted push into the auto industry media. LCI created Magnetic Messages© for Velodyne that worked for multiple audiences – media, investors, industry affiliates, clients and partners. Training spokespersons on the messages allowed for consistency. Media outreach highlighting David Hall (Velodyne’s founder and the inventor of LiDAR), provided an outlet for explaining a complex technology in layman’s terms. Brand Awareness – While Velodyne is the leader in lidar in terms of production, their leadership position in the media wasn’t defined. Working with consumer media allowed LCI to tell Velodyne’s business story while supporting the company’s commitment to autonomous driving as a health and safety issue. Results: PBS’ Nova, CNET Roadshow, Silicon Valley Business Journal (cover story), Business Insider, Reuters and more. MADD Partnership – Autonomous vehicles have the capacity to drastically reduce roadway fatalities. Working in partnership with Mothers Against Drunk Driving, Velodyne created specialty animation and social media campaigns to bring this message to a broad consumer audience. Coordinated media pitching with MADD spokespersons yielded broadcast and print coverage. Results: Media hits included KTVU, Associated Press, Auto Connected Car News and more. World AV Safety Summit – International media attended this gathering of AV experts from all over the world. The event featured speakers from government, automotive manufacturing, citizens groups like Mothers Against Drunk Driving and law enforcement. Bianchi Public Relations and LCI implemented a “media guest” program, flying in auto trade influencers to cover the event. Results: This collection of interested parties fostered both an open dialogue about the industry and sparked media interest in the effects of AV technology on everyday lives. LCI spearheaded media relations and generated impressions in Digital Trends, LED Inside, Digital Trends, Voice of America, Green Car Congress and more. CES – LCI and Bianchi Public Relations had limited time to prepare for media outreach with new products being confirmed just weeks before the show and hit the ground running, creating customized media pitches for tech, auto and broader consumer media. Media alerts supported a scheduled press conference for day 2 of the trade show, taking place in the Velodyne booth in the Las Vegas Convention Center. The press conference was specifically designed to be a follow up to the Connect2Car conference hosted on day 1 off the show floor. LCI also concentrated on Velodyne’s unique position in the industry – with female leadership and strong manufacturing data. During the 5 days of CES Bianchi Public Relations provided the organizational support while LCI representatives worked on the show floor. Results: Efforts paid off with more than 63 media visiting the Velodyne booth, and a well-attended press conference hosted by Velodyne’s President Marta Hall. Coverage included Associated Press, The Information, The Drive, The Globe and Mail, outlets in Germany, China and Korea. Videos from influencers Peter Diamandis and Zenni supported increased social media engagement and grew Velodyne’s social following. Media impressions numbered 685 million and $6.34 million ad equivalency. Velodyne’s share of voice within its competitive set equaled 59%. Trade Press – As an OEM supplier to the auto, marine and industrial industries, Velodyne puts a premium on B2B trade media relations. LCI and Bianchi Public Relations took trade placements to the next level with cover stories in targeted publications such as Automotive Trends and Automotive Engineer. Results: TU Automotive, Sensors Online, Digital Trends, Semiconductor Engineering, Next Mobility and others. Awards – Submitting Velodyne products/personnel for awards was vital to supporting extensive media outreach. Results: Prestigious industry awards such as the IPO Inventor of the Year Award (presented to Velodyne Founder David Hall) and PACE award finalist provided the accolades supporting media interest from Associated Press, The Information, The Verge, Autonomous Vehicle Technology, Mashable, Silicon Valley Business Journal and many others. If you think the Power of PRGN Partnership can help your company succeed on a local, regional or global basis, visit www.prgn.com or contact Jim Bianchi for more information.